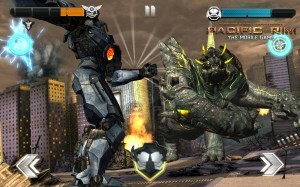 LOS ANGELES – July 11, 2013 – Reliance Games, a leading international developer and publisher of mobile games, today asks gamers to pilot a giant Jaeger robot and defend Earth from invading aliens with the release of Warner Bros. Pictures and Legendary Pictures Pacific Rim for iOS and Android. 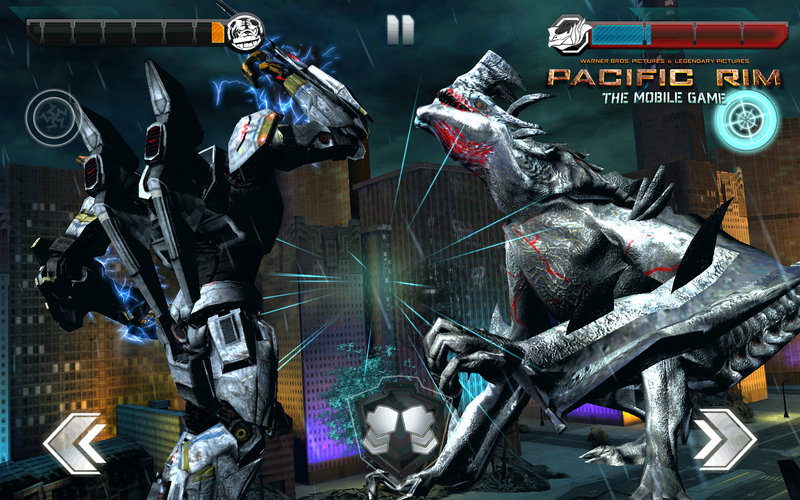 Developed in partnership with Behavior Interactive and based on the film by Guillermo del Toro, coming to theaters July 12, 2013, the Pacific Rim mobile game features epic battles amidst skyscrapers as players swipe and tap to defeat the Kaijus, aliens that have risen from the sea to wipe out humanity. Story Mode: Play over 30 levels and challenge monstrous creatures in intense combat based on the motion picture. Complete bonus objectives to earn more experience. 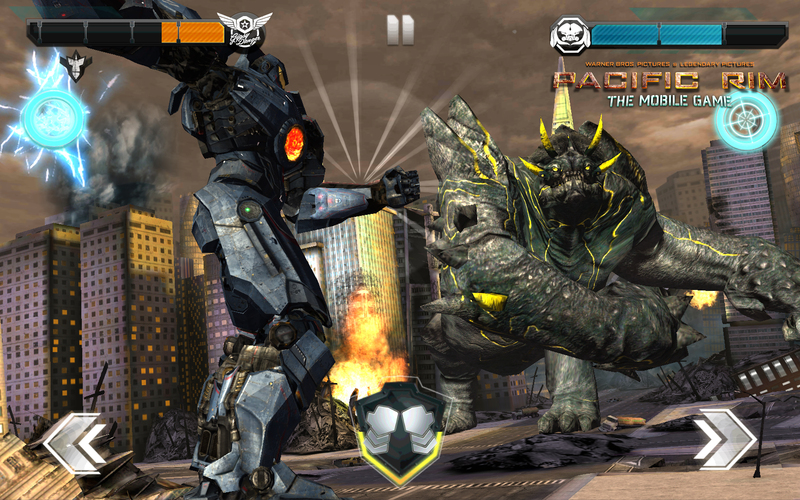 Survival Mode: Can you defend humanity from an endless wave of Kaijus? See how skilled you are with your customized Jaeger. Command five different Jaegers with custom equipment and technology taken from the epic sci-fi movie. Swipe to pack devastating punches to pummel Kaijus. Tap to evade and block. The right timing is key to building awesome combos! Download a press kit here or download the trailer here. Reliance Games, a leading publisher and developer of mass-market mobile games, is the international gaming division of Reliance Entertainment, whose subsidiaries include IM Global, and Codemasters. The game portfolio has more than 600 games for over 2,000 devices across various operating systems like iOS, Android, Windows, Java and Symbian. On the Nokia Store alone, the collective Reliance Games titles have surpassed over 100 million downloads. Its current roster of hit games includes Real Steel, Total Recall, F1 2011 and among others. The company’s content can be accessed worldwide through 80 networks across 40 countries as well as through global app stores. From acclaimed filmmaker Guillermo del Toro comes Warner Bros. Pictures and Legendary Pictures Pacific Rim. When legions of monstrous creatures, known as Kaiju, started rising from the sea, a war began that would take millions of lives and consume humanity’s resources for years on end. To combat the giant Kaiju, a special type of weapon was devised: massive robots, called Jaegers, which are controlled simultaneously by two pilots whose minds are synched in a neural bridge. But as the enemy grows more powerful with each attack, even the Jaegers are proving nearly defenseless in the face of the relentless Kaiju. On the verge of defeat, the forces defending mankind have no choice but to turn to two unlikely heroes—a washed up former pilot (Charlie Hunnam) and an untested trainee (Rinko Kikuchi)—who are teamed to drive a legendary but seemingly obsolete Jaeger from the past. Together, they stand as mankind’s last hope against the mounting apocalypse. Oscar® nominee Guillermo del Toro (“Pan’s Labyrinth”) directed the epic sci-fi action adventure from a script by Travis Beacham and del Toro, story by Beacham. Thomas Tull, Jon Jashni, del Toro and Mary Parent produced the film, with Callum Greene serving as executive producer. The film stars Charlie Hunnam, Idris Elba, Rinko Kikuchi, Charlie Day, Rob Kazinksky, Max Martini, Clifton Collins, Jr., Burn Gorman, and Ron Perlman. Warner Bros. Pictures and Legendary Pictures present a Legendary Pictures/DDY Production, a Guillermo del Toro film. Opening nationwide on July 12, 2013, the film will be distributed by Warner Bros. Pictures, a Warner Bros. Entertainment Company. Legendary Entertainment is a leading media company with film (Legendary Pictures) and comics (Legendary Comics) divisions dedicated to owning, producing and delivering content to mainstream audiences with a targeted focus on the powerful fandom demographic. Earlier this year Legendary completed an acquisition of Nerdist Industries, the leading pop culture multimedia company. Through complete or joint ownership, Legendary has built a library of marquee media properties and has established itself as a trusted brand which consistently delivers high-quality, commercial entertainment including some of the world’s most popular intellectual property. In aggregate, Legendary Pictures-associated productions have realized grosses of more than $7.2 billion worldwide at the box office. Highlights from Legendary’s slate include the Jackie Robinson biopic 42; PACIFIC RIM directed by Guillermo del Toro; SEVENTH SON, directed by Sergei Bodrov; WARCRAFT; Legendary’s upcoming GODZILLA project, based on Toho Company’s famed character; Warren Ellis’ GRAVEL; and MASS EFFECT, based on Electronic Arts’ and BioWare’s hit videogame franchise. Legendary recently announced it will produce Guillermo del Toro’s next feature film, CRIMSON PEAK. Upcoming Legendary releases with partner Warner Bros. include THE HANGOVER PART 3, MAN OF STEEL and 300: RISE OF AN EMPIRE. Previous successful Legendary and Warner Bros. releases include the critically acclaimed INCEPTION ($823 million worldwide), as well as the global blockbusters THE DARK KNIGHT RISES ($1.1 billion worldwide) and THE DARK KNIGHT ($1 billion worldwide), THE HANGOVER PARTS 1and 2 (over $1 billion worldwide total), CLASH OF THE TITANS ($493 million worldwide), and 300 ($456 million worldwide). PARIS – September 4, 2012 – RAW – Realms of Ancient War, the explosive Hack’n’Slash (action/role-playing game) developed by Wizarbox for Xbox LIVE®, PlayStation® Network and PC, has unveiled the Rogue in a new video and RAW‘s release date today!